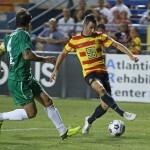 Despite a modern-era record crowd of 11,691, the Fort Lauderdale Strikers struggled in the second half of their NASL season opener versus the New York Cosmos. 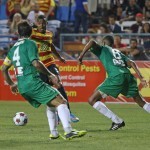 Leo Fernandes’ header in the 58th minute proved to be the difference on a night where everything was going right for the Strikers. 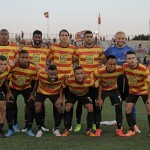 With the loss, the Strikers remain winless versus the Cosmos since their return to the NASL three years ago with a 0-5-1 record. 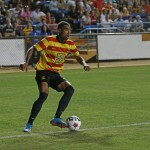 “It was our first game together,” explained Moura. “We created a lot of chances, we just couldn’t score.”Strikers midfielder Victor ‘PC’ Giro had the best opportunity for the home team in the 38th minute. His right-footed blast inside the penalty was on target was saved by Maurer. However, in the second half things were different. 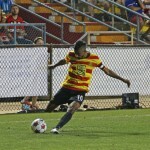 Fort Lauderdale continued to attack the goal but in a 58th-minute corner by former Strikers midfielder Walter Restrepo that found the perfect placement for Fernades for the header, the game changed. “It’s unfortunate that we were scored on in a set piece, but now it’s time to forget this game and move on and focus on Jacksonville,” added PC after the game. Despite the scoreline, the new attack-minded Strikers outshot New York 14 to 8 and doubled up 6 to 3 on the shots on goal category. Stefano Pinho, Moura and PC came close to scoring for the Strikers in the first half, all forcing Maurer to make good saves for the Cosmos. 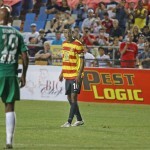 The Strikers now prepare for an in-state rivalry at Lockhart Stadium on Saturday, April 11 as they host expansion-side Jacksonville Armada, who broke the NASL single-game attendance record this weekend with 16,164 fans at EverBank Field.